Gretsch have announced details of their new G Series kits. The GS1, positioned at the beginner's end of the market, ships with 10"x7" and 12"x8", 14" floor tom, 22"x16" bass drum and 14"x5.5" snare for £574.80. Also included is a Gibraltar 4602 hardware pack, Sabian SBR cymbal two pack and Gretsch 5A sticks. Gretsch's GS2 is priced £694.80 and offers 10"x7" and 12"x8" toms, a choice of 14"x14" or 16"x16" floor tom, 20"x18" or 22"x18" bass drum and 14"x5.5" snare. 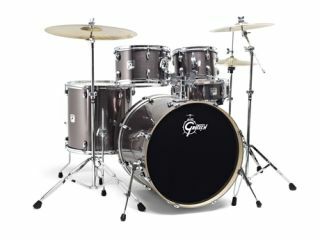 Gibraltar's 4600 hardware pack, Sabian SBR three pack and Gretsch sticks also come as standard. Both lines include Gretsch's quick-sized toms and double tom holder. For more details visit www.gretschdrums.com.